The latest Universities and Colleges Admissions Service (UCAS) data shows a continuing downward trend in application volumes for the 2017 admissions cycle. As of the 30 June application deadline for programmes beginning this September, there were 4% fewer applications for UK higher education this year. This reflects a 4% drop in UK applicants but also a 5% decline in applications from students from other EU countries. That shortfall in EU admissions files was only partly offset by a 2% increase in applications from foreign students outside the EU. The 30 June application deadline effectively brings the main admissions period to an end, and UCAS reports a total of 649,700 applications filed for 2017. This amounts to roughly 25,000 fewer applicants than in 2016. Prospective EU students accounted for 7.5% of the 2017 applicant pool, and foreign students from outside the EU another 11%. 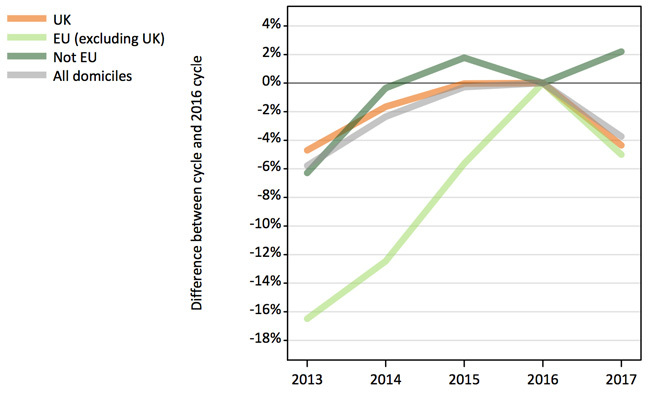 This latest data extends the trends that we began to observe in UCAS application counts from earlier this year. Those earlier reports were based on application volumes for the main 15 January deadline for UK admissions. However, after 15 January, UCAS continues to send applications to British institutions up until 30 June. The admissions service reports that there were an additional 85,510 applications received between January and June this year, representing about 13% of all files for the 2017 cycle. The 2% increase in non-EU applications for this year works out to just over 1,500 more applicants for 2017 compared to 2016. China, India, the UAE, and US were among some of the strongest gainers for this year, and drove much of that overall growth. Those non-EU gains, however, were more than offset by a decline of 2,600 applications from students within the EU, with France, Germany, Ireland, and Italy some of the more significant falling markets for this year. This entry was posted in Europe, Higher Education, Regions, United Kingdom and tagged undergraduate admissions, British higher education institutions, education abroad, undergraduate student recruitment, tertiary education overseas.